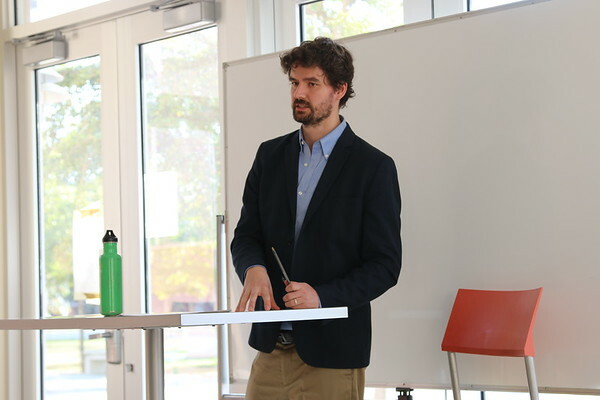 Gabriel Hetland, professor of Latin-American, Caribbean, and Latino Studies, and Sociology at SUNY Albany, spoke in the ACE Lounge March 14 on the situation in Venezuela. The crisis in Venezuela is messy, complicated and not entirely its embattled president’s doing, an expert on Latin America said at a recent lecture at New College. The recent power blackouts in Venezuela put the media spotlight on that country’s political and economic deterioration. U.S. officials have used video footage of Venezuelans traveling on foot to neighboring countries to purchase household necessities, siphoning dirty water from creeks for use in their homes, and sorting through trash in search of foodstuffs to argue for sanctions and possible military action against Venezuela. For his part, Venezuelan President Nicolás Maduro denies there is a humanitarian crisis in Venezuela and has accused the U.S. of exploiting economic conditions in Venezuela to get U.S. military into the country and stage a coup against him. Hetland argues, most recently in an article in The Nation, for a more nuanced and “messy analysis” of the crisis in Venezuela. While Hetland does not exonerate Maduro of responsibility for his role in the blackout or the broader economic collapse, he says Maduro is only partly to blame for that country’s economic and political troubles. U.S. sanctions and support for violent opposition to the Maduro administration, Hetland posits, also contribute to the country’s woes. “Only the most myopic analysis could ignore the government’s clear responsibility for the perilous state of Venezuela’s electric grid,” said Hetland. The country, for instance, invested over $9 billion in the Tocoma Dam, a back-up facility for the Guri Dam, which supplies over 80 percent of Venezuela’s electricity. The Tocoma Dam’s failure to activate when the Guri Dam failed plunged the country into darkness and caused deaths at hospitals throughout the country. U.S. media outlets largely reported the story as a crisis of Maduro’s making, and opposition leaders within Venezuela were happy to appropriate that narrative to promote their own agenda. Hetland warns against this simplistic interpretation of the situation in Venezuela. Blackouts have been common for some time, as Hetland noted while conducting field work there for his dissertation, and one reason for their frequency is that U.S. sanctions have blocked the necessary fuel to produce electricity from entering the country. However Washington and Caracas resolve their differences, Hetland hopes they avoid military conflict in the already embattled country. The Social Science and Humanities divisions sponsored Hetland’s talk, along with International and Area Studies area of concentration.